Change is a weird concept especially when you wish the change didn’t have to happen. This is where you meet a cross road. You’ve got the option to think about all of the things that might have gone wrong. All of the things you could have done to make things better. You could think to yourself how can I fix this. There are probably already a million questions running through your heard and to be perfectly honest with you. These aren’t your questions to answer. Sometimes in life you don’t get to call the shots. Sometimes your decisions are made for you. Sometimes you just have to roll with the punches and while it might destroy you on the inside life goes on. It’s totally normal to have days where you don’t want to get out of bed but eventually you will find something to look forward to and you will find your excitement in life again. There is no timeframe of when this might happen and while I wish there was some kind of indication the fact of the matter is you won’t even realise it has happened when it does. In life we occasionally come across someone really special. Someone unlike anyone that we have ever met before. Someone who means more to us than we could ever possibly imagine. This friend, boyfriend or girlfriend is someone who will probably continue to influence us for a long time. I just want to tell you the story of a lady I work with because I think keeping an open mind is the most important thing. Ok so this lady met a boy in high school they dated for a few years and things were great. They went off to university and decided to break things off as they went in their own directions on their own journeys. They remained friends keeping in touch and eventually lost touch. The lady I work with married a man and spend 20 years happily married to him. Unfortunately the marriage didn’t last and they decided to divorce. 30 years later she stumbled across the guy from school at the time he was single and they began spending more time together. They’re now back in a relationship and have since got married. To me that is a soul mate. It doesn’t matter how much time goes past that love would always be there. Not every situation is going to have a happy outcome like this situation but it’s just an example of what something can be when the timing is right. Don’t ever close the door fully because you just don’t know what is around the corner. That old saying you don’t know what you’ve got until it’s gone is all too true sometimes. While I don’t believe in burning bridges or fully closing doors or chapters in your life I also believe in getting on with life and making sure you’re doing what is right by you. You can’t let someone hold you back from living your life, achieving your dreams and exploring the places you want to go. It’s a difficult thing to try and balance but it definitely isn’t impossible. Of course it is extremely difficult to begin with and it probably will be difficult for a long time but eventually you will find that sparkle again. When you do you will appreciate it so much more. These are some quotes I have come across recently that have become my word in life. I think I have already blogged this one but I keep going back to it everyday. All three of these things are so important and there isn’t one that is more important than the other. You have to love to be able to let go and I believe that living gracefully is part of loving as well. In order to love you must live gracefully. Living gracefully is including someone else in your plans and putting their needs above your own sometimes. Love unconditionally, tread carefully and walk with grace and it this might not be meant for you but it is ok to let go. 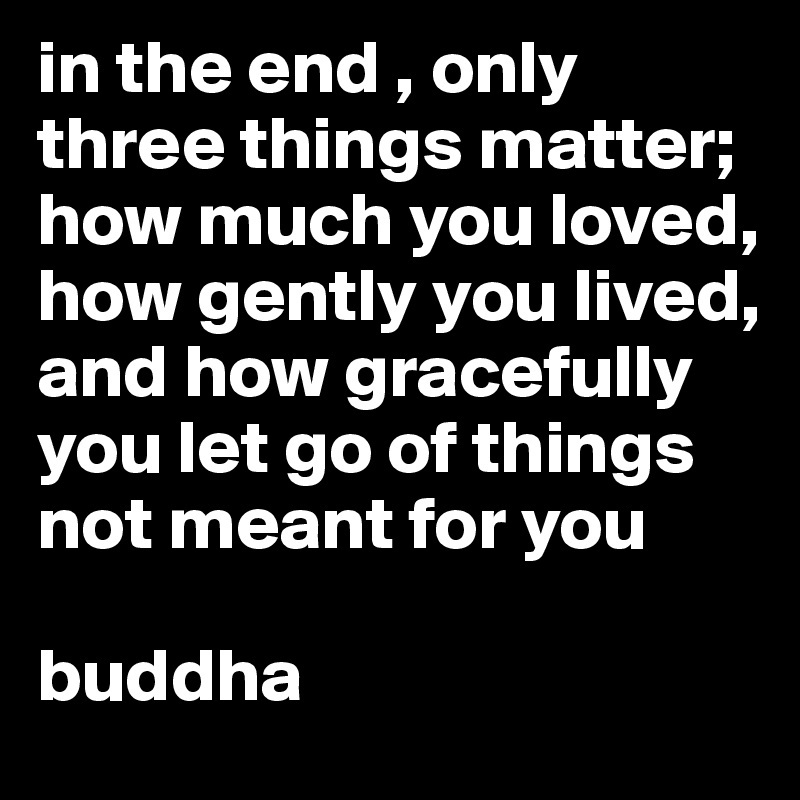 As much as you loved it’s important to let go gently. Burning bridges isn’t going to help anyone. Quietly close the door. There is no need to slam it. You’re perfectly entitled to some time to yourself but try to keep that communication line open when you’ve had some time to heal. 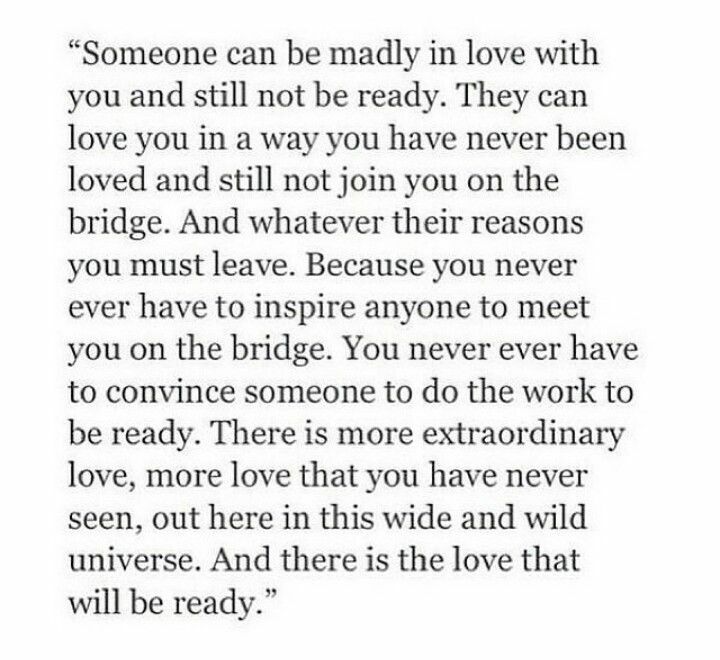 This is one of the most beautiful things I have ever read. Sometimes when something doesn’t work out you just feel rejected and I don’t believe that is right. Some people have strong feelings for you, they might be in love with you. They might not admit it but deep down their feelings are a lot stronger than they would ever admit. That is ok. You don’t need to push them. You don’t need to fight for them. They just need some time and space. Give them as much time and space as they need. 1 of two things will happen. They will realise they you’re not right for them and you will continue in life and eventually find love that is right for you… or this person will realise just how much you mean to them and they will try and get you back. It is then up to you to decide what you want. Will the connection be the same, is this an option you are willing to try, did too much time pass and have your feelings subsided? It’s all a part of life that in time you will discover. There is no right or wrong answer. No one can give you advice on this one. Your best friend might think they know what is going on, how you’re feeling and how a relationship has effected you but the truth of the matter is this is between you and your partner. You don’t need to consult anyone. My advise would be to take a day to think it over. Think of the pros and cons. Weigh up every option. When your decision is made let go of any hurt any hate or any confusion that you might be feeling. Focus on the future and making plans of how to include each other in your futures. If time passes and you do decide to go in your own direction try not to rush into anything. You don’t have to be in a relationship to feel good about yourself. You don’t need someone else to find validation. You are quite capable of living your life for you. 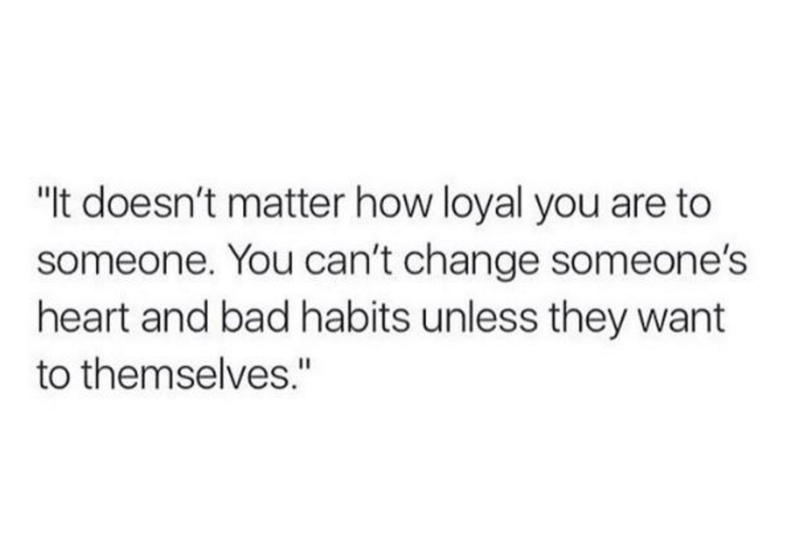 You managed before you met this person and you will manage long after they’re gone. You are most definitely stronger than you think. I don’t believe there is any right or wrong way to move on. Some people will tell you to cut all ties and just do you. If that’s what you think is right give it a go. You will only know what to do after you try each technique. Don’t be afraid to ask for help. Try not to rely on you ex partner for that support. While they have been your comfort place for so long that isn’t their place and you’ve got to find comfort without them. Your friends all have your back and will be there when you need them. When you’re feeling lonely or sad turn to them. You’d be there for them in the same way that they are there for you. Don’t be afraid to express your emotions, never apologise for hurting. These are all normal things to experience and you might feel like you’re exaggerating but you’re not. No one knows what you’ve been through and what you’re feeling. I think that is one of the most beautiful things in life. No one really knows. It’s a completely personal thing. You can’t explain it and no one else can feel it. Treasure that feeling it is special. When you’re feeling most sad think about the goofy silly memories you have. Those are your memories forever and that is something that you can cherish as long as your mind allows it. We all move through life at different paces. While you might be ready for a relationship, to settle down and get comfortable that might not be the case for your partner. Neither one of you is right or wrong you’re just at a different time in your life. Timing can be such a pain. It can ruin something that is amazing but it can give you an opportunity to get more life experience and go on adventures without having to think of someone else. Think of this as an opportunity. It is sad that you don’t get to share these opportunities with that friend but you can’t stay down. Go and explore, treat yourself, make new friends, spend some time alone. Start a blog, write a song, make a video or go to the gym do what ever it is that you need to do. Everyone is different but I definitely recommend turning this experience into something positive. It will give you motivation and will enable you to deal with the hurt in a positive way. There is no right way to deal with any of this it’s all just about finding your way and finding a positive outcome from a situation that hurts like nothing else ever has. The thing you need to remember be kind, be strong and eventually you will be free.